Home for the holidays, I have limited time on the water. Family and friends occupy most of it. Every now and then I get to sneak off for a quick fishing trip. Often, these little jaunts are on familiar waters around home for wild trout. One particular stream near home provides a quick holiday fix. Small stream water in a rough and tumble picturesque environment. The water flows fast in and around boulders, slate, and logs. Perfect hiding spots for small trout waiting in ambush for a smorgasbord of aquatic life floating downstream. I had anticipated the water on the stream to be high and slightly off colored. Streams around my house were completely blown out. After I made my way over the mountain, the streams were low and clear. I was shocked. This altered my strategy significantly. I no longer had the cover of high and dirty water. All of a sudden, I found myself crawling upstream on hands and knees sling shotting casts into holding water. Often, you only have one chance in each particular lie. If you catch one out of a hole, you move on, because all the commotion surely scares everything around. My short jaunt found success with several willing wild browns. Several more, shook free of my barbless fly as they cartwheeled out of the water and downstream. After a few hundred yards of water, my thirst for the moment was fulfilled and I headed home for some breakfast and the company of the holidays. As I made my way up I-95 towards the Lehigh Valley, I couldn't wrap around my head that it was Christmas time. As anglers, time has a way of being warped by our moments on the water. Having spent a large chunk of time on the road and on the water during the fall, the year went by in a blur. My two hour car ride home served as a time of reflection as I contemplated the year's events and tried to think about Christmas time spent with family, friends, and the dogs. However, in the back of my mind was an itch that needed to be satisfied as soon as possible. I had an urge to fish my home waters for the wild brown trout of my youth. It had been several months, and I needed a quick fix. I spent the better part of my first day home with my brother and father. We went on a trip to Cabelas and ran assorted errands before the Christmas holiday. We made it home in time for a quick one hour fishing trip down the road, where I caught my first fish on fly thirteen years ago. I made my way through the woods to a good starting point. I planned to power fish a two hundred yard stretch before dark. The stream underwent a facelift since the last time I left it. High water events left it transformed and super clean of any sediment. Recent rains had the levels high and slightly off color. It was a good time to be fishing for wild brown trout. My first cast found a new depression along a run of slate. My indicator plunged and I tied into a slab of gold and brown punctuated by dots of black, red, and assorted blue halos. A perfect specimen from a perfect stream, during a perfect time of year. Satisfied, I left the stream and headed home. I slowly transitioned from the grinch who went fishing to the son and brother that I am. Ready for Christmas, it was good to be home. Early in the morning before light illuminated the river, I was patiently awaiting stream side along a favorite seam on everyones favorite hole. I was sandwiched between two fallen trees and only one angler could truly fit in the space and get a good drift in the seam. Nonetheless, a group of four guys came and parked on either side of me in a ten yard space. They didn't ask, just came and set up shop. I left that spot and the river for the rest of the day, perturbed to say the least. Our search for new water brought us to an unfamiliar/highly trafficked waterway in Western NY. Arriving around noon, every pull off was full of cars and anglers. We decided to check one last pull off farther upstream and found the place deserted. Over the next few hours, we had almost a mile entirely to ourselves. Hard to find on a tributary, anywhere in the Great Lakes. The afternoon was overcast and drizzly. Topping it off, the temperature was in the 50s. It was a perfect day to be on the water. We took full advantage. For the first time in several days, Adam decided to bring out the indicator rig and preceded to catch several steelhead in the shallow runs and riffles underneath a canopy of trees. He did so, when all he wanted to catch was a brown trout. 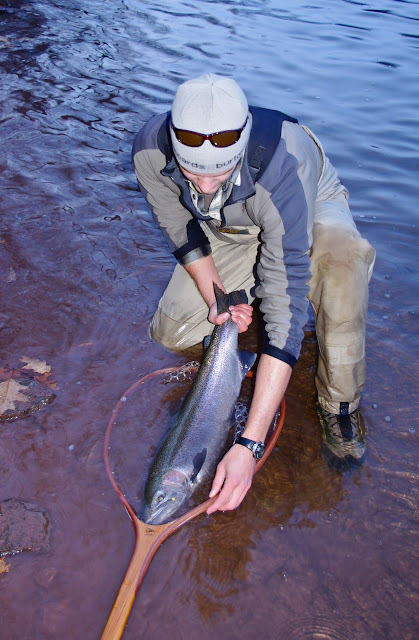 I preceded to catch the browns, when all I wanted to catch was a few steelhead. Nonetheless, it was fun. Seclusion can be the hardest thing to find in the entire sport of fly fishing. 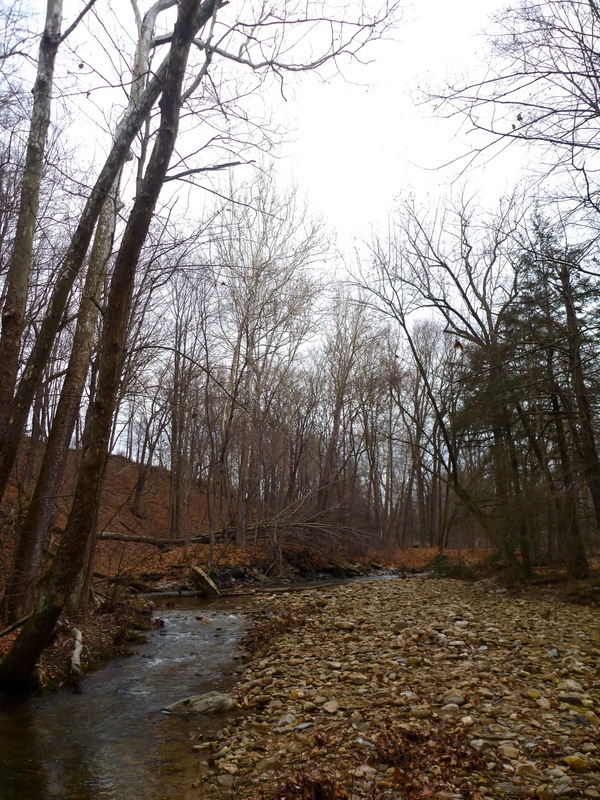 My favorite times on water, are when I have a small stream and wild fish all to myself. I am free to focus and enjoy the seclusion one cast at a time. On the Great Lakes tributaries, you can catch a fish, turn around, and find someone standing in the spot you hooked up in with zero remorse. There is very little etiquette, unless you find yourself miraculously fishing with guys swinging flies with two handed switch/spey rods. Then it's simply understood. However, that is a rarity, and like seclusion, extremely hard to find. As the rest of the group headed up stream in search of better water. I opted to stay and fish the first stretch of water we laid eyes on. The stretch was far from prime, its only appeal was the lack of another human being as far as the eye could see. Finding solitude on a Great Lake trib is rare and I intended to take full advantage. I devised a game plan on the bank of what looked like Willy Wonka’s Chocolate River. I faced a wide slow moving run so turbid its depth was a mystery. It was an interesting scenario to say the least. I chose a weightless Senyo’s That 70’s Sculpin fitted with a custom monster cone (shown above without a cone), fished on a short tippet behind a sink tip. I considered the strike zone to be just off the bottom. To insure my fly got there no matter the depth, I rigged up with a 5/5 MOW heavy tip T-14/Floating. I fished the run in a typical step down fashion but unable to swing in the super slow current. I decided on fan-casting and some seductive stripping, making three casts before advancing (45˚ up stream, 90˚, down stream 45˚) Midway down the run an unexpected take caught me off guard. My fly was hit hard just as the sink tip entered the guides. Actually scaring me a bit I set the hook in fear. Needless to say I set way too hard and snapped my tippet, or so I thought. I stood in silence and watched the ripples dissipate from where the fish broke the surface. I re-rigged with the heaviest tippet I had and began where I left off. Images of huge brown trout flooded my head and the smile on the face of the next angler to catch it. I hoped it would be fly fisherman because the real prize is dangling from the fish’s mouth and need not go to waste. My daydreaming was interrupted as my fly received another crushing blow. I was connected. The fish jumped and its coloration had me excited for an Atlantic salmon. Gliding the fish to hand my heart sank as my Atlantic slowly turned into a northern pike. Soon after the release I put two and two together and all images of a sculpin toting monster brown went up in smoke. 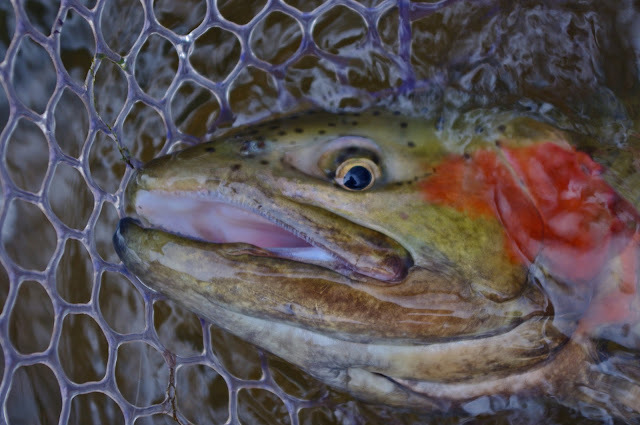 The unfamiliar water flowed between my legs as I stared blankly into my fly box. My eyes perused nymphs, eggs, and a few tantalizing streamers. What did the fish want? Would this be any different than the other waters I was more accustomed to? 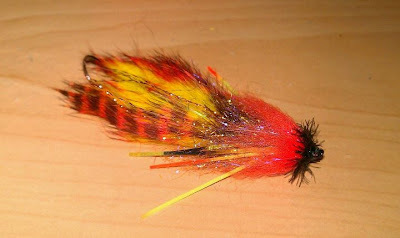 I ended up tying on a streamer that I swung through several riffles. A hundred yards downstream, I misjudged the amount of line I had out during my circle spey, and the sculpin was last seen dangling from a branch on the opposite bank. This forced me to re-enter my fly box where the same questions repeated in my head. After a few minutes, I changed my entire rig. Back to an indicator and an egg pattern. Why change what always works? I made my way to a riffle pool combo that ran into a bank at the base of a tree that was partially fallen into the hole. There was a large undercut about ten yards long that was protected by the tree and all its branches laying over the water. It was a big risk/reward situation. I knew deep down that there was probably a few trout hiding out in there. I just had to get it in front of their faces. I took my time gradually getting closer and closer to the dangerous snag. After every few casts, I adjusted the length of my drift, along and under the bank, and tinkered with the depth of my rig. I anticipated the unknown. 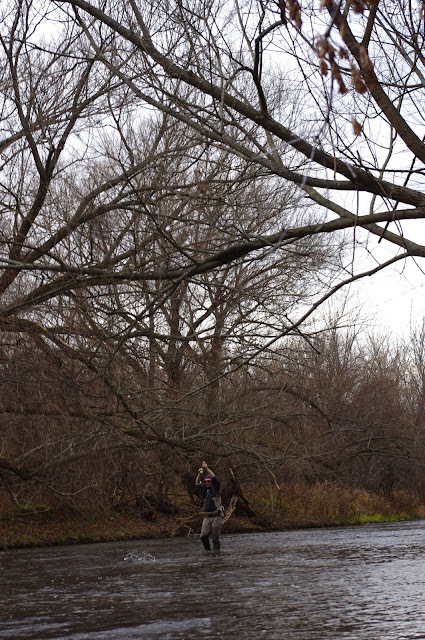 I roll casted several yards upstream of the bank, before re-roll casting my line above my indicator. My flies sunk twice as fast and my indicator stood tall, revealing a dead drift. My flies entered the undercut as my indicator grazed the grass and root wad. The rig went under the overhang, and I knew this was it. A few yards later, the float plunged under the surface. To get a hookset, I had to set hard, low, and downstream under the overhang. It worked. Head thrashes revealed a nice brown at the end of my line, and she made her way into the undercut. I kept my rod tip low (in the water), and got her out of there. A few moments later, 25 inches of brown trout laid in the bottom of the net, for some admiration. On the second day, we met up with some new acquaintances. They were some of my brothers friends from Lancaster and it was their first foray on this section of the Great Lakes tributaries. I partnered up with Tom, whom I fished with before, and took him to a seam that I knew held fish. The bank was pretty tight so we decided to rotate the water, fish for fish. Something you don't see that often on the tribs. Any form of etiquette is rarely seen. I wish I could say that for the first few hours that morning, I matched Tom fish for fish. But he outscored me 5-3. However, numbers do not matter. It was a great few hours of action. It was great to not only share in the water, but to also share in his first tributary brown trout and largest steelhead he has ever caught. As I landed the fish, I could see his knees shaking and I could hear a giddiness in his voice.